(1) Propellant consumption must be ''low'', that is, /sp must be as high as possible. (2) Thrust must be "high" to ensure acceleration and AV needed by the mission. but the power demand would increase eight times. So, increasing propulsion efficiency (that is, /sp) means reducing the mass flowrate of propellants, not the power required to accelerate them. The power will inexorably increase. Remember the second limitation of chemical propulsion is "slow" interplanetary travel. In the present context, what can be defined "fast" is: 1-3 years at most for unmanned probes, and several months to a year for manned vehicles. This means that any advanced propulsion system must economically enable A V much larger than 10 or 12km/s, in fact many tens of km/s. In Section 7.1 we have seen that to achieve these speeds a propulsion system must be capable of sustained acceleration for days or even weeks, with a commensurate power requirement. Now, nuclear power converts fuel mass into energy according to E = mc2; the J available in fission is of order 8.2 x 1013J/kg using U, almost 10 million times larger than in combustion. This factor alone does justify propulsion based on nuclear reactions. However, how to exploit such J is one of the key questions. For instance, Section 7.2 pointed out that typical nuclear reactors cannot operate at temperatures much higher than, say, 2,500 K. So, at a first glance, a clear advantage of replacing H2/O2 combustion, characterized by similar temperatures, with nuclear heating, as done in so-called nuclear thermal rockets (NTR), is not evident. 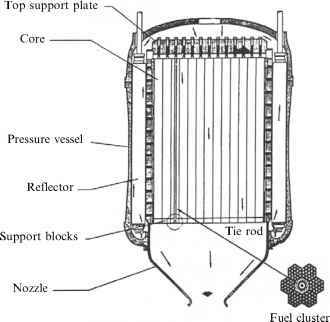 However, in NTR the propellant can be pure hydrogen, and its molecular weight, 2, is much lower than the average 9 or 10 of the burnt gas produced by an H2/O2 rocket. At similar temperature, an NTR ejecting pure hydrogen will have Isp higher by the square root of the ratio (9 to 10)/2, i.e., by a factor of about 2.2. In fact, the best Isp of LRE is about 450 s; the Isp of NTR tested in the past was of order 900 s. Furthermore, above 2,500 K a certain fraction of hydrogen begins to dissociate into H atoms (MW = 1), so that Isp grows a little more, perhaps near 950 s.
From Isp = 450 s of a chemical rocket to 1,000 s of a nuclear thermal rocket means the total mass of propellants needed to inject into LEO a given payload may be reduced by a factor of 2.5. This is as if the gross weight of the US Shuttle at lift-off (about 2,800 tons) was reduced to 800 tons. Thus, both physics and engineering point to nuclear propulsion as the key to practical space exploration [Powell et al., 2004a]. The fundamental limitation of chemical propulsion is "low" Isp. One might ask, what is the explanation for this limitation. Aside from its units, for an ideal (complete, isentropic one-dimensional) expansion in a nozzle, Isp coincides with the exhaust velocity, Ve. This velocity is limited because it determines the kinetic energy of the flow, and this energy cannot be higher than that gases reach inside the thrust chamber because of chemical heat release. That is, in the chamber the heat released forms molecules of average mass m, possessing high translational, rotational and vibrational energy (call all of them internal energy E), and very little organized flow velocity. When the hot gas expands in the nozzle, molecular collisions gradually force all molecules to acquire the same orderly flow velocity at the expense of internal (disordered) energy. At the nozzle exit, in the ideal case this velocity is Ve = (2 E/m)1/2 if we neglect relativistic effects. The ratio E/m is the energy density, J, and, try as we might, even with H2/O2, J cannot reach above 107 J/kg. Ultimately, the limitation on V and Isp is due to the potential of the electro-weak force, because it is this force that shapes chemical bonds. The next question is then what can be expected from choosing as energy source the only alternative, that based on the nuclear ''strong'' force. that is conserved. Note that m is the relativistic mass, i.e., the rest mass, mo, divided by v/1 - (V/c)2. What are the limitation of chemical rocket propulsive system?